Eminem is using Twitter in an extremely clever way. He has a show coming up and is Tweeting out where fans can find free tickets. Instead of going into all of the details I will point you towards Chris Brogan’s post about the incident. Here it is. The one thing I use LinkedIn for is social groups. I am in a few social media groups which always provide great content. I found this this morning which is especially intriguing. You can see it in full size here. Thanks to http://applicant.com for this. Last evening I attended the inaugural Ignite Boulder gathering. The event featured a plethora of presentations on various topics, some relating to new media and design, and others offering a fast-paced guide to effectively crashing a party while rolling stag. All in all the event was fun, informative and featured free beer, so really, I have no complaints, it was a great success! Also, Thanks to Andrew Hyde and organizers for all the hard work put into making this thing happen. One presentation really stuck with me from last night. It was a presentation by Kevin Collie (not sure on the spelling), entitled The Year of Mobile. This has been a topic of interest for me for multiple years and many people have made inaccurate predictions of when the year of mobile will actually arrive. Predictors have been saying “this is the year of mobile” since 92′. In the mid to late 90’s the Palm Pilot was introduced to the scene and had many thinking the transformation had begun, it didn’t. The Blackberry arrived, people were convinced things where changing for good, they were wrong. Now we have the iPhone, which users interact with more than their kids, and still we haven’t reached the mobile transformation. Truth of the matter is that only 1.5% of the market has an iPhone, making the transformation more of a tech subculture than a technological transformation. I couldn’t have agreed more with the presentation up to this point, unless its a necessity for business, not a convenience, people are going to be reluctant to drop 400 bills on an iPhone and another couple hundred on service. Its not worth it to many people just so they can be interrupted at lunch to see they received a new e-mail or so they can twitter about how good their cobb salad is. I personally haven’t agreed with the hype surrounding mobile technology simply because it wasn’t viable for the majority of citizens. The mobile age has been here for tech savy business folks, but the transformation to a mobile society where marketing can thrive has yet to reach the mass market. I was convinced last night that it soon will. Last evening the presenter said that the movement to widespread mobile will arrive when web 2.0 goes mobile and more importantly when prices points are brought down. Well that time may be 2009 with the introduction of Android. Android has been in the works since late 2007 with Google but is to be released in late 2008 or 09′, however, some are already out. 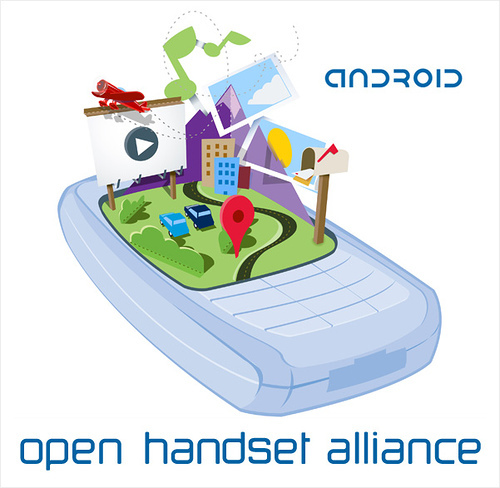 Google is the working mechanism behind Android, offering at least 3 prototypes for the system in Feb. 2008. With Google’s financial backing, development experience, and good standing in the online community we may see a transformation begin. 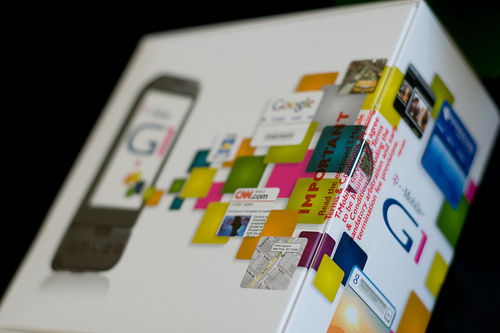 The web 2.0 will be brought on through T-Mobile’s G1, the first phone to support Android, released mid 08′. As far as cost, the presentation featured a segment about price points and how this product will stay afloat mainstream. In 2009 Android technology will be offered in Walmart, making the price go down and the scope of demographic drastically increase.